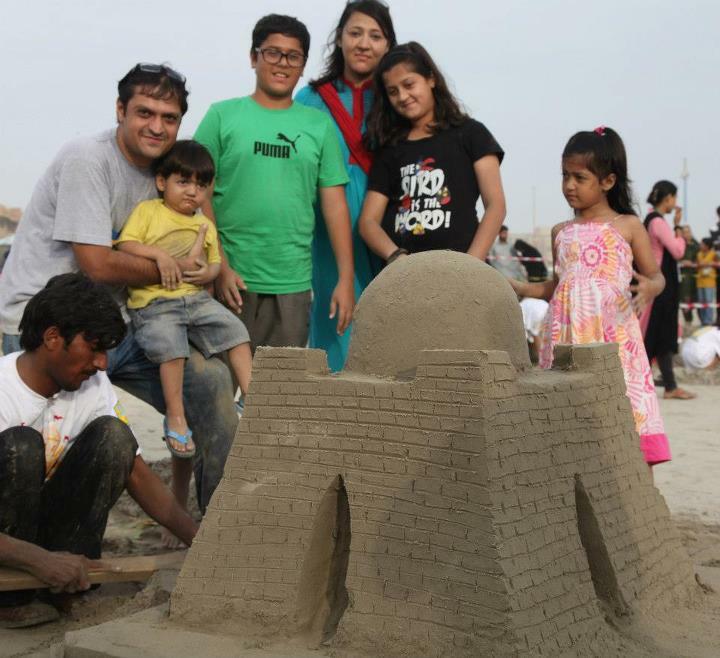 September 9, 2012: The lively people of Karachi displayed their creativity and their love for the sun and sand at the Sea View, Clifton, Karachi, during the second sand castle building contest byLet’s Build On (LBoN) organised by a group of young, dynamic art aficionados. Building sand castles is a fun summer activity for people of all ages. Lucky for Karachiites, we are blessed with lovely sandy beache which make an ideal place for recreational activities and family picnics. Despite the many disturbing things Karachiites faces, like bomb blasts, loadshedding, and killer traffic jams, they are known for using every opportunity they can find to have fun, to the fullest! Some were amateurs; others employed professional techniques and tools. At least 250-300 people were watching the sculptors work their magic with undivided attention. Muntazir and Nabeel, the two highly motivated brains behind this event, mentioned that this will become a biannual event now. They will soon be starting activities on the beach that will teach children sand sculpting techniques. The young leaders believe that events like this will help raise awareness about keeping the beach clean and encourage healthy and purposeful activities. In all, I thought that the event was a great, peaceful way of having fun. It served as a positive outlet of self-expression, particularly for the youth of Karachi. Events like this are an exciting way for families to spend weekend afternoons together. Read more by Farah here. this web page dailly and obtain pleasant information from here every day. Truly good style and design and outstanding content , nothing at all else we want : D.